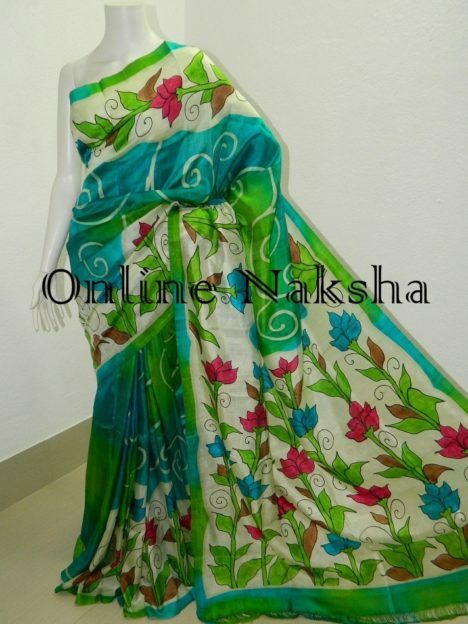 Grab this Floral Handpainted Pure Silk Saree Online to add color in your wardrobe. Flow yourself with modernity and fashion this time with exclusive collection of handpainted sarees. Featured saree painted with different colors. Therefore the look has become graceful. Show off your unique style with this acid paint saree. This is soft as well as light. So one can easily carry it. The overall look is simple yet classy. For your formal drape it is neither too bright nor too light. Pick it up this time to become unique from the rests. This comes with a running blouse piece. Visit the site www.onlinenaksha.com to get variety of Bengal Handloom.